Zen Studios loves pinball. They are the studio behind the hit series known on some systems as Zen Pinball and on others as Pinball FX. The series has single-handedly revived pinball gaming albeit not in its mechanical form. The biggest draw has been a release of a series of tables based on Marvel Comics properties like Hulk and The Avengers. The newest Marvel table is based on the Civil War story arc from a few years ago that pitted Iron Man’s pro-government and Superhero Registration faction against Captain America’s pro-freedom faction. 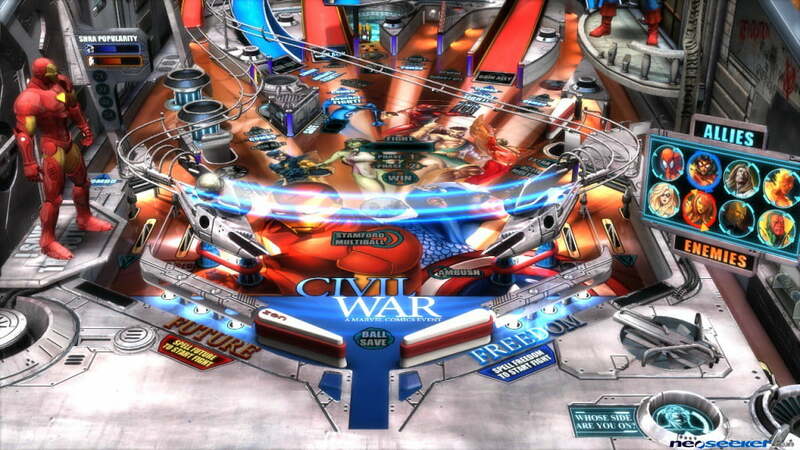 It is a bit strange to think a pinball table as having a plot but this is exactly what we get with Civil War. As the table starts, a video plays of the news report of an incident that kicked off the Civil War in the comics, the Stamford Incident. The player is then bombarded with multiple balls in an attempt to score as many points as possible before the action really starts. This section is skippable and if you do decide to skip, the game takes and uses your highest score from previous attempts. This little sequence adds to experience and is a nice little treat for fans of the story arc. When the real game starts, it is pinball as usual. As players smash their balls up ramps and into bumpers, Iron Man and Captain America stand on opposite corners of the machine and argue back and forth over the Superhero Registration Act. Little side quests happen during the game that require players to hit ramps and objects to do things like recruit heroes to their side. The biggest feature of the table is that Iron Man and Captain America fight. They meet in the top right corner of the table and action seems to slow down a bit and the player must hit the right ramps to win the fight. The missions on the table suffer from a time limit that is a bit tight. The table is also mostly ramps creating a strategy that comes down to hitting the right angle off the flipper to hit the various ramps. For pinball pros, neither of these are a bad thing but for those of us that just mash the flippers and pray for miracles, the table can be a bit daunting. Marvel properties are hot right now even when presented in pinball form. World War Hulk, Fear Itself, and now Civil War are all huge arcs that have gotten tables in Zen’s Pinball titles. Iron Man vs Captain America is a cool concept that delivers with choice quotes. A few issues with missions and table structure keep the Civil War table from being as good as the other tables but it still should excite Marvel fans.